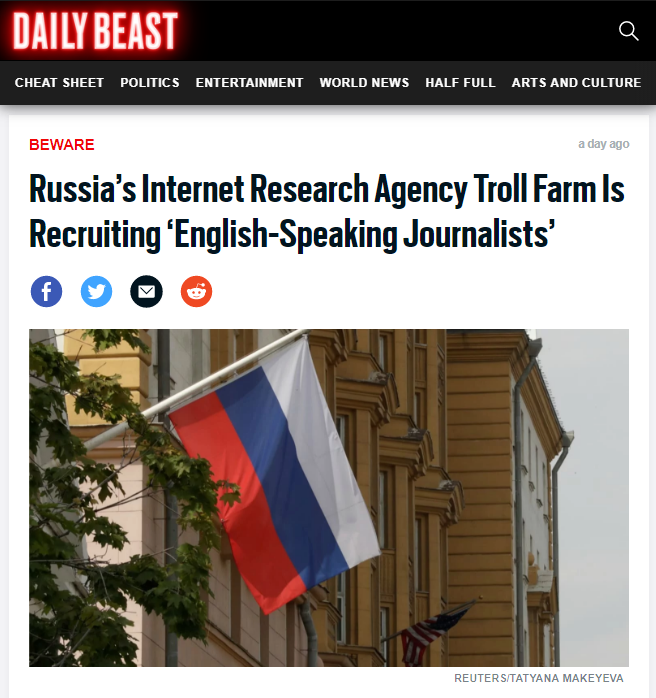 Yesterday, I blogged about a job ad inviting English-speaking journalists to join The Federal News Agency, a pro-Kremlin website operated by the Russian troll farm. 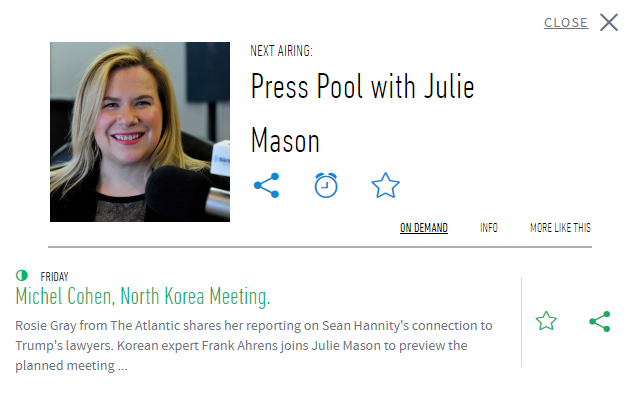 The story was subsequently picked up by The Daily Beast, Political Wire, and POTUS Press Pool. The Federal News Agency, an Internet Research Agency-linked and pro-Kremlin website, has been recruiting “English-speaking journalists and authors” to work on its “Wake Up, America!” campaign, according to investigative-reporting blog Shooting the Messenger. The campaign’s purpose is to stand against “hegemony of the U.S. authorities in the information field,” the Federal News Agency claims. “Due to the growing political censorship imposed by the United States, there remains less and less of information sources that are not under control of the U.S. authorities,” an announcement on the website read. “In this regard, U.S. citizens cannot receive objective and independent information about events occurring on the territory of America and throughout the world.” The campaign was launched last week, and asks applicants to send their résumés to a Russian email address. 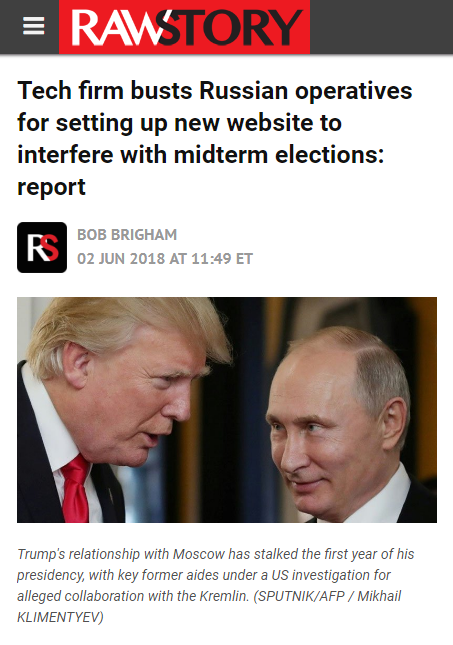 Internet Research Agency trolls also been promoting the campaign from LiveJournal accounts, as they have been banned from Facebook and Instagram. 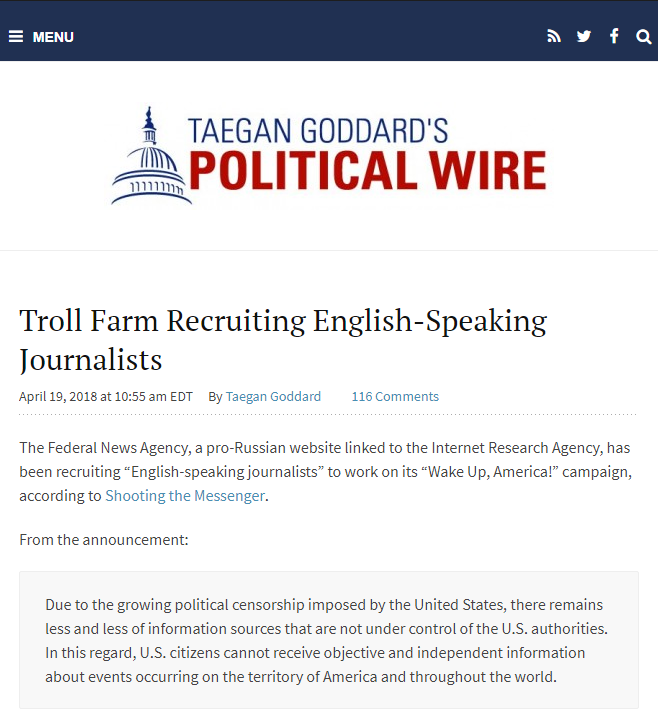 The Federal News Agency, a pro-Russian website linked to the Internet Research Agency, has been recruiting “English-speaking journalists” to work on its “Wake Up, America!” campaign, according to Shooting the Messenger. Due to the growing political censorship imposed by the United States, there remains less and less of information sources that are not under control of the U.S. authorities. In this regard, U.S. citizens cannot receive objective and independent information about events occurring on the territory of America and throughout the world.